Why yes we are serious! Why not think something so good for you is fun? This information is provided to you by Malena one of the amazing hygienists in our office. The CDC states that over 64.7 million adults in the United States have periodontal disease, also referred to as gum disease. Gum disease is caused by an abundance of unhealthy bacteria in the mouth that triggers an inflammatory response and activates the immune system. 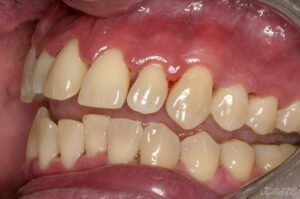 As a result, gums swell, become red, produces an unpleasant odor, bleeding gums, and even bone and tooth loss. The presence of these bacteria affects the overall health of the body. Unlike other parts of the body, the immune system alone cannot do its job effectively to remove the infection because the plaque or build up has attached and hardened on the tooth or the root surface of the tooth. This plaque acts like a splinter lodged under the tissue and has to be mechanically removed by a dental hygienist. 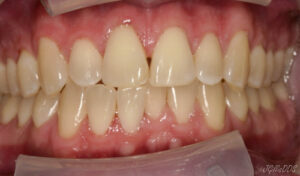 If left untreated or its not removed, a patient develops gum disease. in some areas and red, swollen, infected tissue. brushing, flossing, and a professional cleaning! As a whole, most people have accepted bleeding in the mouth as “normal”. Often we hear, things like “oh, my gums have always bled” or “everyone’s gums bleed…don’t they?” Outside of a few exceptions, the gum tissue should not bleed during a routine dental cleaning. The tissue in the gums is the same tissue as the tissue on the hands. After a day of gardening, if we scrubbed our nails with a nailbrush to remove the dirt from under the nails and the hands bled, we would be very concerned. 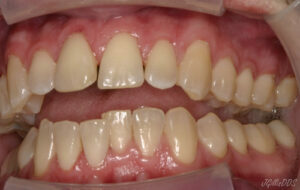 Essentially, a dental cleaning is doing the same thing with bacteria from under the gums and the tooth surface. If the hands bled like the gums, we would all be VERY concerned. the red swollen tissue and bleeding. 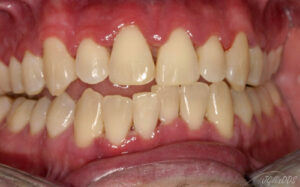 Something as simple as flossing can prevent this! The bacteria causing gum disease must be removed on a regular basis and should be routinely done in during a hygiene appointment. During each appointment, we discuss ways to improve the management of the bacterial load and ways to make your mouth healthier, which results in more overall whole body wellness. We also strive to make the appointment comfortable and dare I say fun! We often use humor, mixed with a little science as a way to engage in a new conversation about gum health, as the old ways of education are not working according to these statistics. We are concerned for your bleeding gums! At our office we value our patients, we make every effort to effectively achieve and maintain health for each person with a gum care program especially designed for the individual. Call today (970) 242-3635 to schedule an appointment with one of our hygienists to reserve your cleaning appointment so we can share our philosophy that FLOSSING IS FUN.